If Saturday’s St. John’s-Georgetown battle at Madison Square Garden was a preview of a future Big East Tournament matchup, we could be gearing up to add another chapter in this historical rivalry. The Red Storm and Hoyas, who came into the afternoon in eighth and nine place in the conference, respectively, put together a surprisingly entertaining game. 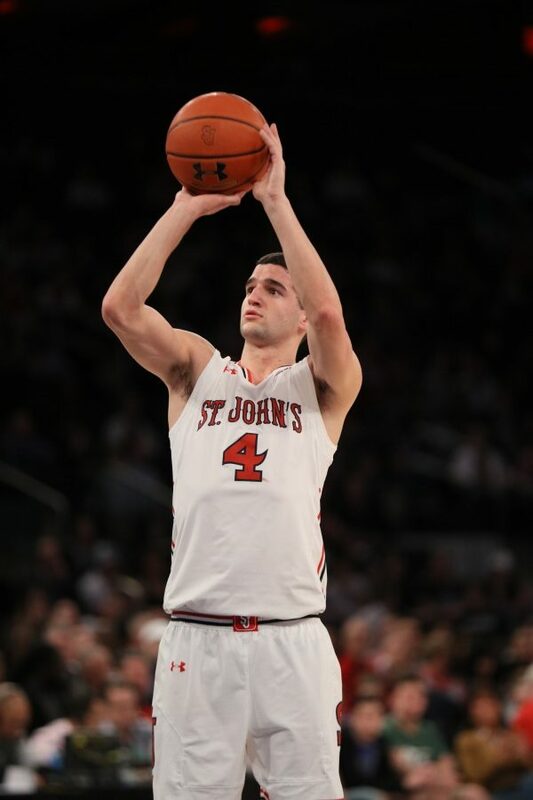 And after an alternating pair of 17-0 first half runs, a plethora of turnovers and a near epic collapse in the closing minutes, the Johnnies prevailed for an 86-80 win. But if St. John’s (13-16, 7-9) has anything to say about it, they won’t be playing Georgetown in the opening round of the Big East Tournament. In fact, the Red Storm would like to not be playing in the tournament’s opening round at all, and that goal is somewhat still in sight. The win on Saturday keeps St. John’s just one game behind sixth place in the conference, and a first round bye, with two left to play. But to keep those hopes still attainable, the Johnnies still had to get past Georgetown, something that proved to be no easy task. St. John’s trailed the Hoyas, 13-10, early in the first half, however a 17-0 run for the Red Storm pushed them to a 27-13 advantage with eight minutes left. Federico Mussini orchestrated the run, with 11 of his 16 points coming during the span. From that point the back-and-forth afternoon was just beginning. Georgetown responded immediately with a 17-0 run of their own over the next six minutes, putting the teams right back where they started. The Hoyas went into halftime with a 36-35 advantage despite committing 16 turnovers in the first half. However, a Bashir Ahmed jumper to begin the second half put St. John’s back on top, and that would end up being a lead they wouldn’t relinquish the rest of the afternoon. The Red Storm extended their lead to as many as seven throughout the first 15 minutes of the half, however they were unable to pull away and put the game out of reach. St. John’s led by seven, 78-71 with 1:41 left before the Hoyas made things incredibly interesting. Throughout the next 21 seconds Georgetown’s Marcus Derrickson drained a long three, Rodney Pryor then stole the ensuing St. John’s inbounds pass, hit a layup and was fouled. After Pryor made his free throw, the Red Storm lead was suddenly down to one with 1:20 remaining. From there, the Red Storm turned to their sensational backcourt duo to close the game out and re-energize the shocked Garden crowd. Shamorie Ponds was fouled on the following possession and hit both free throws, and after an empty Georgetown possession, Marcus LoVett did the same with 31 seconds left. Overall the Johnnies were able to ice the game at the free throw line, with their final 10 points of the game coming from the charity stripe. Two final free throws from Malik Ellison with seven seconds remaining officially put the game out reach and gave St. John’s an 86-80 win. Ponds was once again the frontman for the Red Storm, with 24 points on sensational 10-15 shooting. Mullin had high words for his freshman star following the game. Ahmed and Mussini each tallied 16, however Ahmed shot just 4-13 from the field while Mussini knocked down three of his four shots from three-point range. LoVett had a quiet game by his standards, 11 points and four assists in just 25 minutes, but his free throw shooting in the closing moments were a huge part of the victory. Tariq Owens had four points and three blocks before leaving the game in the second half with a sprained ankle. With now two games left to play in the regular season, St. John’s will look to hold this momentum heading into the Big East Tournament. According to Ponds, the Red Storm have already made significant improvements throughout the course of the season, and looking at the results, it would be hard to disagree with him.